For months, Intelligence and Security Agencies around the world have been trying to identify a man only known as ‘Abu Ahmad’, involved in recruiting a number of Islamist militants for attacks in Europe. “Abdelhamid Abaaoud [a Belgian-Moroccan killed by police five days after the November 13 atrocities] was only a go-between, not a senior figure. We know the mastermind [of the Paris Attacks] but I will remain discreet on this point,” DGSE Director Bernard Bajolet told Parliament members last year. The investigators now believe they have identified him as Ousama Atar. “He’s the only coordinator from Syria to have been identified during the investigations,” a French security source told the AFP news agency. RELATED POST: Is Belgian ISIS Jihadist Osama Atar the ‘Mastermind’ of the Paris and Brussels attacks? The Iraqi Ambassador to Belgium, Jawad Al-Hindawi, says he was charged with terrorism offences. “Apart from the evidence which was in the Iraqi (files) which led to his indictment, there were other authorities that had information about him, not only the Iraqi government, that shows he was very involved with the Al Qaeda organization and that was proven by other parties,” says the ambassador. Al-Hindawi claims Atar belonged to an organization called “Al Fatah,” an alleged terrorist network operating out of Syria under the pretext of offering Iraqis humanitarian aid. A 2009 letter sent from the US Embassy to Belgian officials in Jordan outlined how Atar attempted a prison break with terror leader Abu Musab al-Zarqawi. It was while he was in US custody that Atar made new jihadi contacts, including Abu Bakr al-Baghdadi, who would go on to create ISIS. The following document demonstrates that the Belgian government intervened to obtain the release of Ousama Atar from the Iraqi government. Mr Atar’s situation is being followed closely. Repeated requests made by Belgium to the Iraqi government to consider an early release for humanitarian reasons have been fruitless so far. Mr Atar received a consular visit this summer from our embassy in Amman. He is also being monitored closely by the International Red Cross. Pursuant in part to repeated contacts with the Iraqi authorities, we are confident that his health is being monitored appropriately. FPS Foreign Affairs is in regular contact with Mr Atar’s family in Belgium. In a 2010 call for action to activists, Amnesty urged the Iraqi government to provide proper medical care, referring to Atar’s conviction of illegally crossing from Syria to Iraq. On November 14 2010, Amnesty International issued the following message (The full text is added to the references of this post.) The cancer claim proved to be false. According to his lawyer, Atar was found to have a colon infection. Earlier this month (May 2017), the daughter of Ahmed El Khannouss was arrested in connection to a terrorism case. 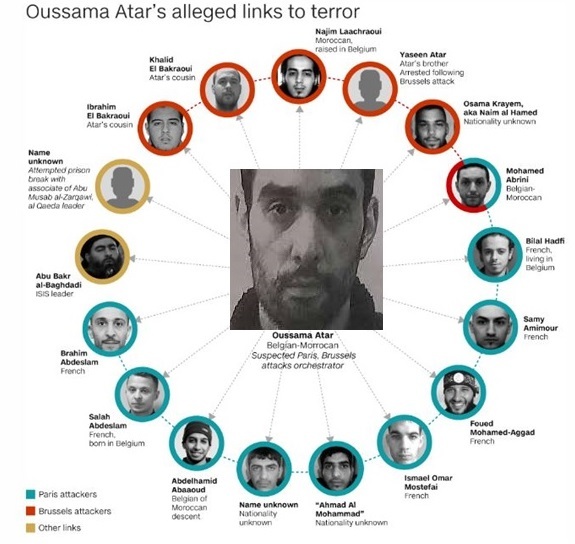 Abu Ahmad/Osama Atar is a cousin of Ibrahim and Khalid el-Bakraoui (two of the Brussels bombers). He was very well known to Belgian authorities. Ibrahim el-Bakraoui detonated a suitcase bomb at Zaventem Airport, and his younger brother Khalid detonated his device at Maalbeek Metro station. Their mother’s home has been raided by police several times since the attacks. Belgian Authorities are not as convinced as others — French and American Intelligence Agencies — that Atar is the mastermind of the Paris and Brussels attacks. The order for the Brussels and Paris attacks came from very high up in the ISIS hierarchy. Ousama Atar — being one of the attack commanders– is “one theory among many others”. Atar’s lawyer — Vincent Lurqin — appealed to Belgian intelligence for more information. A letter from Belgian intelligence shows that they denied knowing anything about Atar. At the same time, they refused a court order to turn over his intelligence file. According to an official letter, the Iraqis (Read: “the Americans”) had released Atar on two conditions. First, the Belgian Foreign Ministry would not issue a passport. Second, his activities would be monitored. 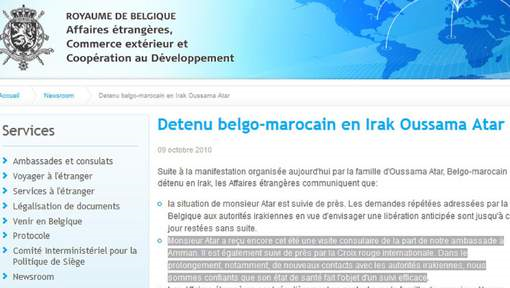 A source close to the inquiry has revealed that the Belgian Foreign Ministry did issue a passport to Ousama Atar. The reasons for this remain a mystery to this day. According to a judicial source, in August 2016 — four months after the Brussels attack and in the midst of a global manhunt — Atar quietly visited his mother and siblings in Brussels. 2013 — Atar was arrested while trying to flee to Tunisia, and then disappeared after his release. The following video clearly identifies some of the Belgian Politicians who campaigned for Mr Oussama Atar’s release. L’affaire Ecolo – Oussama Atar – Pourquoi Zoe Genot se tait aujourd’hui ? Oussama Atar, a 26-year-old Belgian national, is in need of urgent medical care at al-Rusafa Prison in Iraq. According to information provided to the Belgian embassy by the prison authorities he has a tumour in the kidney and must undergo an urgent operation in the next two weeks. Reports also indicate that he has lost a great amount of weight and is very ill. Amnesty International fears for his health and is calling on the Iraqi authorities to provide urgently needed medical care. Oussama Atar has been in prison for the past six years. He was convicted of illegally crossing the border between Syria and Iraq and sentenced to 10 years in prison. He has been held in the prisons of Abu Ghraib, Camp Bucca, Camp Cropper, and he is currently held in al-Rusafa prison in Baghdad. According to his family, his health has deteriorated in the past months. Amnesty International raised concerns about his general state of well-being to the Iraqi authorities in May 2010, but the organisation had received no answer on his behalf. In light of this latest information, Amnesty International fears for his current state of health. Amnesty International has received reports that the prison contacted the Belgian embassy in Jordan (which has responsibility for Belgium’s relations with Iraq) to inform them that Oussama Atar had a tumour in the kidney and that he urgently need to receive treatment in the next two weeks. Amnesty International has also been informed that the Belgian government is reported to have expressed its willingness to provide the necessary treatment for Oussama Atar. Amnesty International calls on the Iraqi authorities, in particular those responsible for al-Rusafa Prison, to ensure that Oussama Atar receives full and immediate access to the medical care that he needs in conformity with the UN Standard Minimal Rules for the Treatment of Prisoners. According the UN Standard Minimal Rules, if adequate medical care is not available in the prison hospital, the prisoner must be transferred for treatment to an appropriate institution outside of the prison system, such as a specialised institution or civil hospital (22.2). Amnesty International is also calling on the prison authorities to cover the costs of such treatment as required by the United Nations Body of Principles for the Protection of All Persons under Any Form of Detention or Imprisonment (Principle 24). Amnesty International believes the denial of medical care to Oussama Atar may amount to cruel, inhuman or degrading treatment.  Urging the authorities to ensure that Oussama Atar receives full and immediate access to medical care, in accordance with the provisions set out in the UN Standard Minimum Rules for the Treatment of Prisoners; if the authorities are unable to urgently provide specialist medical care then they should make arrangements with the Belgian government to guarantee his treatment. This entry was posted in Brussels attacks 2016, Paris Attacks 2015 and tagged Brussels attacks 2016, Iraq, Jawad Al-Hindawi, Ousama Atar, Paris Attacks 2015, Syria. Bookmark the permalink.